Roelof Petrus van Wyk in collaboration with Jade de Waal presents A Feast of Friends, a one night culinary intervention in Meschac Gaba’s Museum Restaurant. In an evening shared with strangers, A Feast of Friends aims to break down the precarious boundaries between people and promote a greater understanding of the idea that we are interconnected, in some small way exploring the African notion of togetherness, Ubuntu: I am, because you are. The artists take their cue from the unlikely friendship between Winnie Mandela and Adele de Waal, two women on opposite sides of the political spectrum in apartheid South Africa. In 1977 against all odds, including their own preconceived ideas of each other, these two women became true friends in the small Free State town of Brandfort. Adele’s Herb Encrusted Chicken, a favourite of Mrs Mandela, will form a core dish on this South African inspired menu. Roelof Petrus van Wyk (born 1969) lives and works in Johannesburg, South Africa. He is currently completing a Masters degree at Goldsmiths College, London. His photographic work has been shown in South Africa and internationally; in London at the Victoria and Albert Museum in Figures and Fictions, and most recently at the Jack Bell Gallery as part of the launch of the photographic book, Jong Afrikaner – a Self Portrait. He is currently completing a compendium of six photographic books on the precarious landscapes of southern Africa called Scenes from a Struggle 1652 –**. Jade de Waal (born 1990) lives and works in Cape Town, South Africa where she is a Jazz student at the University of Cape Town. She is one of the subjects in Roelof Petrus van Wyk’s Jong Afrikaner – a Self Portrait project. 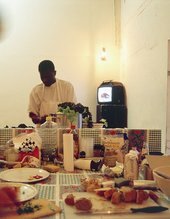 De Waal is the creative mind behind a series of cooking adventures called Food Jams, wherein the guests are as involved in the preparation of the meal as in the enjoyment of the eating. She is also the granddaughter of Adele de Waal.